BestBackups' Dropbox review, looking at the strengths and weaknesses of one of the most popular backup services on the market. One of the best-known storage providers on the market, Dropbox excels as a platform for syncing and sharing files. While security concerns may put some people off, its reasonable price and ease of use makes it an appealing choice. You can read a detailed review below or sign up now. 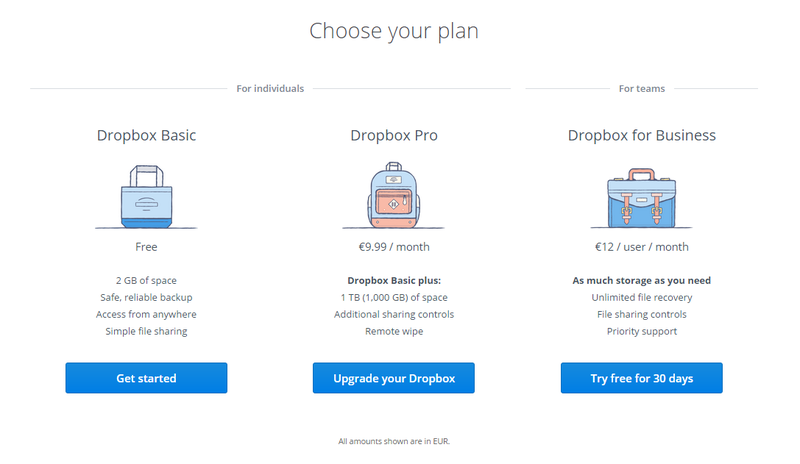 Individual users get to choose between two different Dropbox price plans; a free account offering 2GB of storage space, and a Pro account that provides 1TB of space and costs €9.99 (around $11) per month. There is also a Business subscription available for €12 (approximately $13.50) per user per month, featuring unlimited storage space, priority support and increased control over sharing options. In addition to standard plans, all personal Dropbox users can earn additional space by encouraging their friends to sign up too. Basic users can accumulate up to 16GB this way ,while those with a paid-up Pro subscription can work their way up to a maximum of 32GB. Each successful recommendation will earn 500MB for Basic subscribers and 1GB for Pros, making a huge increase in your storage space. If you want to sign up, you can purchase subscriptions using MasterCard, Visa, American Express, Discover, Visa Electron and Carte Bleue cards, or via PayPal. Quick and easy access, simple file sharing, and the option to backup from multiple devices make Dropbox something of a poster-boy for Cloud storage (if backups could ever have such a thing). You won’t find enough storage space to hang on to all of your files, and security is fairly limited, but if you’re looking for convenience and access to your data from anywhere, at any time….then you’ve definitely come to the right place. Dropbox, one of the most popular file storage solutions available today, was first released in 2008; the work of CEO Drew Houston and CTO Arash Ferdowsi. With employees previously working at Google, Motorola and Facebook, the company has over 400 million users worldwide, as well as partnerships with industry giants including Sony Ericsson and Microsoft. Based in San Francisco, they are also a leading figure in the world of business backups, with over 100,000 companies using their services. Backing up your files using Dropbox is a flexible operation – all you need to do is click and drag, whether you’re using the desktop app or their website. You’re free to upload any files you want to, with no restrictions on types or sizes, although you won’t be able to backup files larger than 10GB using the website. Once uploaded, any changes you make to your data will be automatically applied to your backup, and you can keep things organized by creating and renaming folders, and moving your files freely between them. Dropbox is compatible with most major operating systems and has desktop applications available for Windows, Mac, and Linux. Users of iOS, Android, Windows Phone, BlackBerry and Kindle Fire will also all be able to access the mobile version, giving it a much broader appeal than the many providers that only accommodate Windows, Apple and Android devices. Dropbox is arguably best known as a file sharing platform, so it comes as no surprise that its greatest strengths lie in syncing and sharing data. It’s all about convenience here – all files added to your desktop folder or uploaded online will be immediately synced to your Dropbox account. They can then be opened, edited and shared from all devices registered to your account. There are two ways to share files; by creating a link or a shared folder. Links can be accessed by absolutely anyone, regardless of whether or not they also hold Dropbox accounts, and can only be viewed (not edited) by recipients. 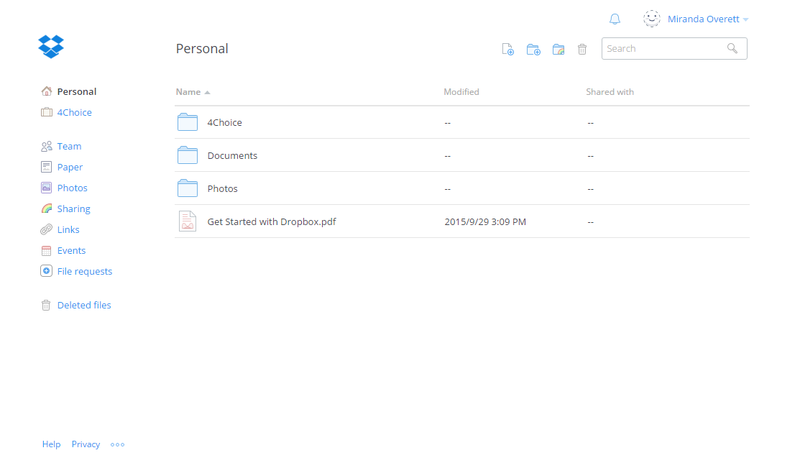 By contrast, members of a shared folder all need to be Dropbox users, and can amend the folder’s contents by deleting, changing or adding files. It’s an ideal tool for collaboration, as changes are synced to all users within a matter of seconds. There are a few extra features granted to Pro users as well, who can grant view-only status to members of shared folders, and also limit who can access shared links by setting expiry dates and passwords. If you’re using Dropbox for work but don’t own a business account, there is also Team – a recently added feature designed to make it quicker and easier to share documents and work collaboratively with colleagues. It allows all members of a company to access basic data in a kind of enormous shared folder, as well as creating additional groups that limit the sharing of relevant files to a single team. If you ever find yourself looking for information that exists only in a deleted document or an older draft of your work, never fear – Dropbox allows you to restore both deleted files and previous versions of your documents for up to 30 days. Pro subscribers also have the option to purchase Extended Version History for $39 per year. This add-on allows you to restore previous versions of your files up to a year after they were created, with the added bonus that only the most recent iteration contributes to your storage quota. Our speed tests are conducted by first uploading five individual files and manually timing how long it takes for their transfers to complete. We then divide the number of MB in each file by the number of seconds it took to upload and convert that result into Mbps. Finally, we run five downloads through the same process, and voila! Results. As you can see in the graph above, Dropbox didn’t fare too well when it came to uploads. With an average speed of just 1.6 Mbps (a 100MB file took around seven minutes to transfer), it falls below the 2 – 3 Mbps range occupied by most of its competitors. 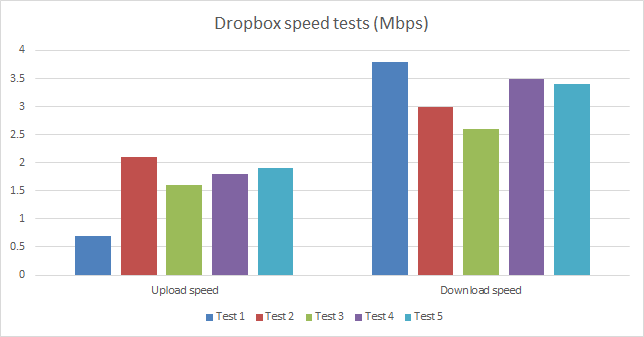 Although downloads were somewhat quicker, the 3.3 Mbps average speed still pales in comparison to most competitors, several of which consistently achieved over 6 Mbps. Having said this, we want to make it clear that, while we try to make our results as accurate as we can, some external factors such as slow broadband and even just having a poor quality router can make an impact on your transfer speeds. As a result, although our figures are designed to give you an idea of what to expect, remember that your own speeds may vary. Dropbox follows industry standard security measures to keep your data private and secure. Files are subject to 256-bit AES encryption while stored in Dropbox data centers, and are transferred via a secure, 128-bit SSL/TLS connection. They also offer optional two-step verification, which requires a second layer of authentication (usually obtained via a text of phone call) before you can access your account. While these are good quality security measures, the level of privacy afforded to Dropbox users has been called into question in recent years, most notably by Edward Snowden in 2014. The main problem is that Dropbox holds the keys needed to decrypt its users’ data, ostensibly to run deduplication processes (checking the contents of your existing files to ensure that new data isn’t replicating what’s already there). What this effectively means, however, is that they are able to access your files at any time and, should hackers attack the Dropbox servers, they’d be able to find everything necessary to decrypt and read your information. There is also a third concern, namely the issue of governmental intervention, as if a subpoena requesting access to your data is issued, Dropbox is legally bound to comply. This problem is not by any means exclusive to Dropbox, although many other backup providers including SpiderOak, CrashPlan, and IDrive do allow you to set a private encryption key. This is a key generated by you setting a private password; it will never be stored or seen in unencrypted form by your provider. Although many people may not feel that this is a necessary measure to take, the fact that Dropbox doesn’t offer the option suggests a fundamental lack of respect for user privacy. Ultimately, although Dropbox’s security is good enough to protect against the majority of everyday threats, if you are concerned about the privacy of your data it may be worth considering an alternative provider. There is also the option to take extra security measures without Dropbox’s input, such as encrypting data before uploading it. 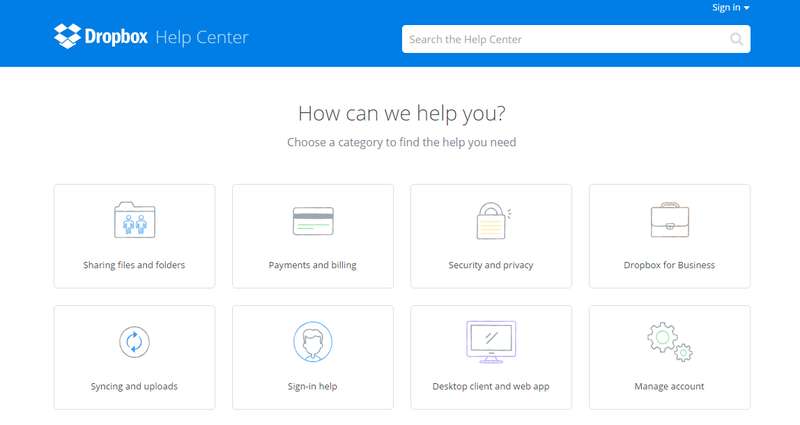 Basic and Pro subscribers looking to contact Dropbox’s customer support can access their Help Center, forums, and submit inquiries by using a support ticket. While these options are somewhat limited (we are big fans of a live chat, which is only available to business users here), the Help Center resources are pretty good. They cover a comprehensive range of topics, from getting started to security information and troubleshooting, and all advice is clear and easy to follow. Their forums are also very accessible and are regularly updated with new questions and answers, as well as featuring designated boards for German, Spanish, French and Portuguese users. While Dropbox for Business customers are promised a response to support requests within 12 working hours, other users have to wait a little longer for a reply. In the end, it took around a day and a half for a representative to get back to us. This is considerably slower than the average time achieved by other providers (approximately four hours), and the information we received was a little unclear in places – leaving us ultimately disappointed in the experience. When it comes to other sources of customer assistance, Dropbox maintains an active Twitter Support account that’s dedicated to troubleshooting customer problems and offering regular hints and tips on using their software. Their primary Twitter page is regularly updated as well, providing over 4 million followers with company news and developments, while similar posts are also displayed on their Facebook page and blog. In addition to this, there is also a Dropbox YouTube account offering user-friendly tutorials and short introductions to new features. Registering with Dropbox takes a matter of seconds, and it’s possible to use the service without even downloading the desktop app. If just backing up online, you can simply click and drag files onto the web page and they will automatically upload. Sharing and organizing documents is easy as well, as processes are mostly intuitive. Downloading the app makes things even simpler as you don’t even have to navigate away from your desktop, and also adds some extra flexibility as it accommodates the uploading of larger files. There is a reason that Dropbox is so popular, and it’s thanks to its sheer simplicity and ease of use. Moving files around Dropbox is much like moving them around on your computer, and everything is written in familiar, user-friendly language. Both uploads and downloads require little more than a click, although you’ll need to unzip downloaded folders and transfer speeds aren’t particularly fast. Setting up Dropbox on your desktop essentially just creates a new folder, which looks and feels exactly like any other. You can copy or drag saved files in from other locations, or save them directly from most applications by selecting your Dropbox folder from the Save As… menu. There’s nothing unusual or uncomfortable here – Dropbox simply slips into your everyday setup without any fuss at all. Pretty much everything that can be done using Dropbox on your computer can also be achieved from their mobile app. From uploading and downloading files, creating file links and sharing folders to leaving comments and making data available offline, options are all easy to find and even easier to implement. It’s an excellent companion to the desktop program. Dropbox is an excellent platform for syncing and sharing files, as it’s easy and intuitive to use and can be quickly integrated into existing day-to-day processes. While not being able to set private keys will raise some considerable concerns for security-conscious users, Dropbox undeniably performs its basic functions very well, and its sheer convenience has given rise to a good reputation and broad public appeal. If you’re comfortable with the lack of private encryption and are looking for an accessible and well-designed storage solution, therefore, it’s a great choice. What do you think of Dropbox? Leave us a comment and let us know!